1:02 I am going to pass on the last two trades-I've worked hard enough. The charts will run to close. 12:46 for reasons I don't understand, the MoonTides have not tracked well after 1:00 the last two days. 12:42 I had my cover order in as soon as I sold, and I did get filled at 1209. 12:40 how did I get the 1209 target? I looked at the S&P TideTracker 3 point quantums and took the nearest one. 12:37 out for +5; what I did there was to realize that we were on the green +Tide; i had missed a good entry due to distractions. so I took a couple of small bites. 9:40 on the charts there is no pipper for the 10:35 time, because my software did not pick it as a Tide Time. I added it manually. 12/16/2011 1:24:50 PM MT bbb****:: Have a great end of the year Al- so Thankful to have found your service. Thanks again. 12/16/2011 11:23:24 AM MT srj****:: Thanks Al. Happy holidays. 12/16/2011 10:25:46 AM MT srj****:: @AL - your FOG chart from this morning seemed to indicate a strong possibility was for the market to go down (at least that is what I read it as - if that is correct). I did not quite follow how you figured out the range expansion from 1/8th to 1/6th please explain (CCT room if that is where it should be) Thanks. 12/16/2011 10:21:43 AM MT srj****:: @mm - have heard of forex traders who use just the Pivot an S/R levels. 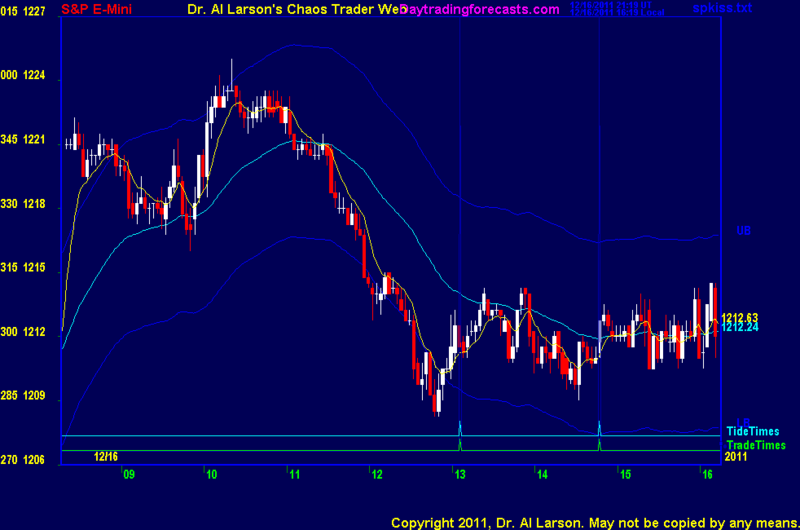 12/16/2011 10:11:03 AM MT mm****:: Isn't it pretty how price moves from one S/R level to the next? 12/16/2011 8:46:28 AM MT srj****:: Thanks BBB - a live example is always great. 12/16/2011 7:45:17 AM MT srj****:: Hi BBB - I put in the question in to the CCT room. Thanks. 12/16/2011 7:40:41 AM MT srj****:: Thanks Al - I will revisit my checklist with your comments. 12/16/2011 7:38:36 AM MT srj****:: Thanks AG - I too have noticed on some days the juice is easy to see (when the market is moving) and when slow I get faked so it is as you say I also thought it is a matter of getting a better feel for it - on some days it is clear when the market takes off smoothly in the MT window, on others when the move is not that well defined I get faked out. I will check out the 3 min bar on completion entries. Also when using CTME Fractal grid the 2 point works well most of the time. FYI - for the exits I use Al's rules - I tried finnessing the exits using various methods and on average they all performed much worse. SRJ: I just keep and eye on the range of the last one or two days - once it drops below 12 points, the juice is pretty weak, so trades are riskier, and I use about a 3 point stop, above that I use a 4 or 5 point stop. when the volatility is greater, the EXMA's work better and it is easier to get good trades. 12/16/2011 6:33:12 AM MT srj****:: gm all. Happy holidays. Al thanks for the FOG chart update.